The hotel heiress threw a bash at V-Moda Fortress, a private house in the Hollywood Hills, on Tuesday night (15.02.11) and an uninvited guest, a Los Angeles musician only known as 'Paz', made off with the special treat. Paz - who got into the bash through his "well-connected buddy Kevin" - decided to take the three-tiered red cake after realising it wasn't being served to the 300 guests. In a posting on his Facebook page - accompanied by a picture of the swiped sweet treat in his kitchen - he wrote: "I woke up this morning with a $2,000 birthday cake in my living room. It's big. It's red. It says 'Paris' and its f****** delicious ... At an inebriated moment I decided no one was going to waste $2,000 worth of anything on my watch. I had to rescue that cake." Paz admits he had to come up with a scheme to get the cake out of the house without any of the security employed to "look for idiots" like him realising what he was doing. But he managed to convince the head of security that he had been told to remove the desert and was soon in his car with his unusual loot. He explained: "In one fluid motion, I sidestep a confused waiter, seize the prize, and face to the door. I pass the security chief again on the way out. I nod purposefully ... he nods in return and 40 seconds later I'm in the front seat of a Nissan Maxima with 70lbs of awesome in my lap. Success!" The cake was made for Paris - who reached the milestone age on Thursday (17.02.11) - by Lucid absinthe and the company are unhappy with Paz's actions. Jared Gurfein - CEO of Viridian Spirits, the company which makes Lucid - said in a statement: "It is very unfortunate that someone stole the cake from Paris' birthday party. 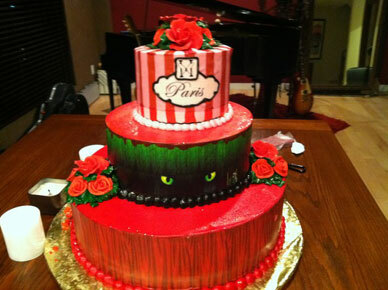 We had the cake designed especially for Paris with Lucid in the batter and a beautiful representation of Lucid's artwork on it, which she had requested to meet the 'Moulin Rouge' theme of the party." Paris - who was presented with another cake that was adorned with a photograph of her - was joined at the bash by her boyfriend Cy Waits, sister Nicky and parents Rick and Kathy, and a host of other guests including Kathy Griffin.